The e-design I am sharing with you today is a special one because it is for one of my besties! Meet Carmen of Label Me Artsy, a fashionista living in Hawaii. Recently, she and her husband purchased a new home and asked if I could help design an office for her. She requested an inspiring space that is both feminine and vibrant. Immediately, I thought of this print that I love by Leigh Viner as inspiration for the room. It is very feminine and has a gorgeous color palette. 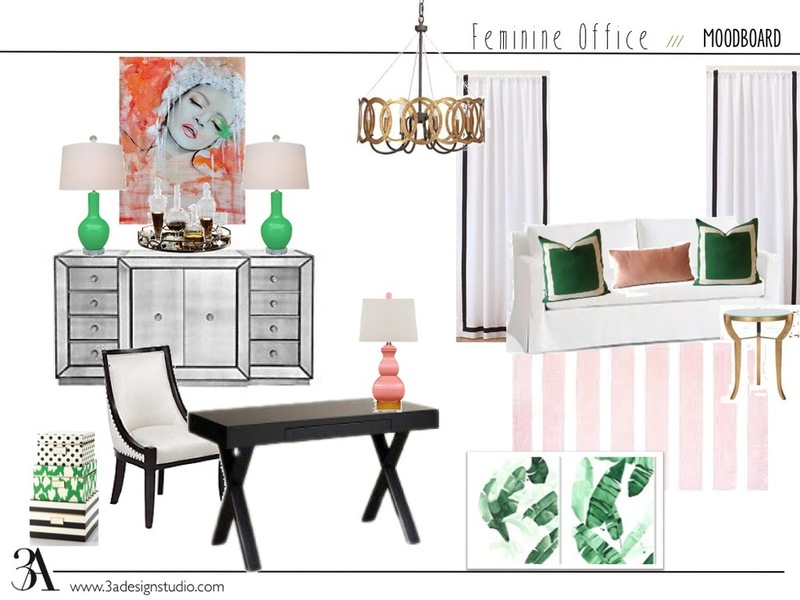 The overall look for the office was a bit tropical glam with emerald greens and blush pinks. Have a look. It was a lot of fun working on this project. Even with the distance, Carmen in Hawaii and me in Florida, through our e-design service we were able to design a beautiful office that Carmen loves. If you need help designing a room or just need help selecting a few pieces to finish off the look of a room, drop us a line. We work with all different project sizes and are currently working on an Ask My Designer service for those small design dilemmas.